Difference between revisions of "Los Santos Riots"
The Los Santos Riots took place over some of the last days of 1992. A major event in the Grand Theft Auto series, the riots started because of the acquittal of Officer Frank Tenpenny. The [[Los Santos Riots]] are the final events of [[Grand Theft Auto: San Andreas]]. A major event in the [[Grand Theft Auto]] series, the riots started because of the acquittal of [[Frank Tenpenny]] during "[[Riot (GTA SA)|Riot]]." On Tenpenny's court date, he was found Not Guilty of all of his charges, including corruption and the murder of Officer Ralph Pendulbury. The public was outraged, fighting, burning cars and buildings, looting houses and stores, and just going completely berzerk. Gangs also took this as an opportunity to fight over turf, as the Police had their hands full. At Tenpenny's trial, he is acquitted of all of charges against him and [[Eddie Pulaski]] (who is dead due to the events in [[High Noon]] but is presumed by the media to be on the run) due to lack of evidence (due to the events seen in [[Misappropriation]]). The charges include corruption, sexual assault and the murder of fellow officer [[Ralph Pendelbury]]. This sparks mass public outrage, leading to city-wide riots, yet these are mostly centered on the lower-class areas in eastern Los Santos. During the riots pedestrians will attack other characters including CJ without provocation. Carl Johnson was seen heading into Big Smoke's Crack Palace on the day the riots ended. He went inside, killing all of Smoke's goons and then Smoke himself. Tenpenny was seen leaving the building, getting into a Firetruck. He and another officer drove off. Sean Johnson grabbed onto the firetruck, and Carl pursued them in a white convertible. Sean was knocked off the truck, but Carl caught him. The chase went across Los Santos. Tenpenny was killed when the firetruck crashed onto the cul-de-sac in Ganton, Los Santos. Upon hearing this news, the public ended the riots. In the [[End of the Line|final mission]] of the game, [[Carl Johnson]] takes down [[Big Smoke]] in his crack-den in [[Los Flores]]/[[East Los Santos in GTA III Era|East Los Santos]]. 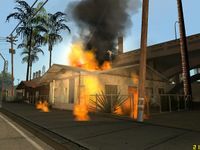 After Big Smoke's death, the building is blown up by Tenpenny, who then escapes in a fire truck, attempting to escape to the [[Los Santos International Airport|airport]]. [[Sweet]] grabs onto the firetruck, with CJ pursuing him in a white [[Feltzer]]. After Sweet is pushed off the truck by another officer, it is pursued through Los Santos, with many of the rioters throwing molotov cocktails and creating blockades. In crossing a bridge over [[Grove Street]], Tenpenny loses control of the truck, crashing it into the road below and dying on the pavement. It is thereafter apparently looted by the homeless and later recovered. Due to his death, justice is seen to be done and the riots subside. In the end, Smoke and Tenpenny were killed, and the Crack Palace was destroyed. Countless casualties and property damage were also paid. The riots were the largest in the Grand Theft Auto series to date. In the end, Smoke and Tenpenny were killed, and the crack palace in East Los Santos was destroyed. Many buildings and property were damaged, as well as numerous people killed. The riots were the largest and most dangerous event depicted in the Grand Theft Auto series to date. * The riots are clearly a reference to the [[:wp:1992 Los Angeles Riots|1992 LA Riots]]. These were caused by the acquittal at a trial of several police officers accused of unfair treatment to African-American [[:wp:Rodney King|Rodney King]]. No charges were levied against the officers, sparking outrage, clearly forming the inspiration for the Los Santos riots, both events also having taken place in the same year. * If the player attacks a looter with a TV the TV will drop and fall through the floor, if this is done on a bridge, the player can go to the water under the bridge and see the TV floating in the water. * When you enter any emergency vehicle, then go to an area where the riot occurred, the following dialogues on the police scanner has changed. While listening to one of the conversations, you can hear screaming, people shouting, sirens, explosions, alarms, etc. * When a train passes where the riot is started, its engineer will get out, even though the train is indestructible. File:LosSantosRiots-GTASA-looter.jpg|A looter, having stolen a TV. Police try to hold back rioters. The Los Santos Riots are the final events of Grand Theft Auto: San Andreas. 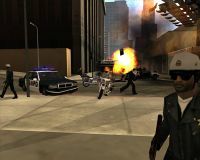 A major event in the Grand Theft Auto series, the riots started because of the acquittal of Frank Tenpenny during "Riot." At Tenpenny's trial, he is acquitted of all of charges against him and Eddie Pulaski (who is dead due to the events in High Noon but is presumed by the media to be on the run) due to lack of evidence (due to the events seen in Misappropriation). The charges include corruption, sexual assault and the murder of fellow officer Ralph Pendelbury. This sparks mass public outrage, leading to city-wide riots, yet these are mostly centered on the lower-class areas in eastern Los Santos. During the riots pedestrians will attack other characters including CJ without provocation. In the final mission of the game, Carl Johnson takes down Big Smoke in his crack-den in Los Flores/East Los Santos. After Big Smoke's death, the building is blown up by Tenpenny, who then escapes in a fire truck, attempting to escape to the airport. Sweet grabs onto the firetruck, with CJ pursuing him in a white Feltzer. After Sweet is pushed off the truck by another officer, it is pursued through Los Santos, with many of the rioters throwing molotov cocktails and creating blockades. In crossing a bridge over Grove Street, Tenpenny loses control of the truck, crashing it into the road below and dying on the pavement. It is thereafter apparently looted by the homeless and later recovered. Due to his death, justice is seen to be done and the riots subside. The riots are clearly a reference to the 1992 LA Riots. These were caused by the acquittal at a trial of several police officers accused of unfair treatment to African-American Rodney King. No charges were levied against the officers, sparking outrage, clearly forming the inspiration for the Los Santos riots, both events also having taken place in the same year. If the player attacks a looter with a TV the TV will drop and fall through the floor, if this is done on a bridge, the player can go to the water under the bridge and see the TV floating in the water. When you enter any emergency vehicle, then go to an area where the riot occurred, the following dialogues on the police scanner has changed. While listening to one of the conversations, you can hear screaming, people shouting, sirens, explosions, alarms, etc. When a train passes where the riot is started, its engineer will get out, even though the train is indestructible. A looter, having stolen a TV. This page was last modified on 20 September 2013, at 05:12.